Known from one site. Despite a number of searches in similar habitat it has not been found elsewhere. Not threatened due to inaccessibility of its habitat. Joubertina district, Kouga River Valley. Cliff faces in quartzitic sandstone. Van Jaarsveld, E. 1998. 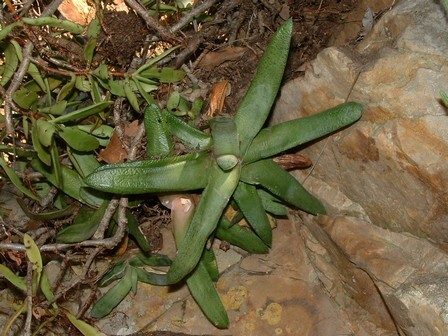 A new taxon and new combinations in the Gasteria carinata complex. Cactus and Succulent Journal 70(2):65-71.